July 27, 2018 By Elizabeth Lindemann 3 Comments / This post may contain affiliate links. 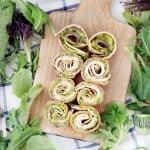 These Zucchini Butter and Turkey Roll-Ups are easy to meal-prep on the weekend and are the perfect fun lunch to pack on busy weekday mornings for kids and adults alike! Can you believe it’s almost back-to-school time? This is the perfect kid-friendly and veggie-packed lunch to pack for your picky eater to make mornings a breeze. Zucchini butter might just be my new favorite thing. I used it in these sandwiches as an alternative to mayonnaise. 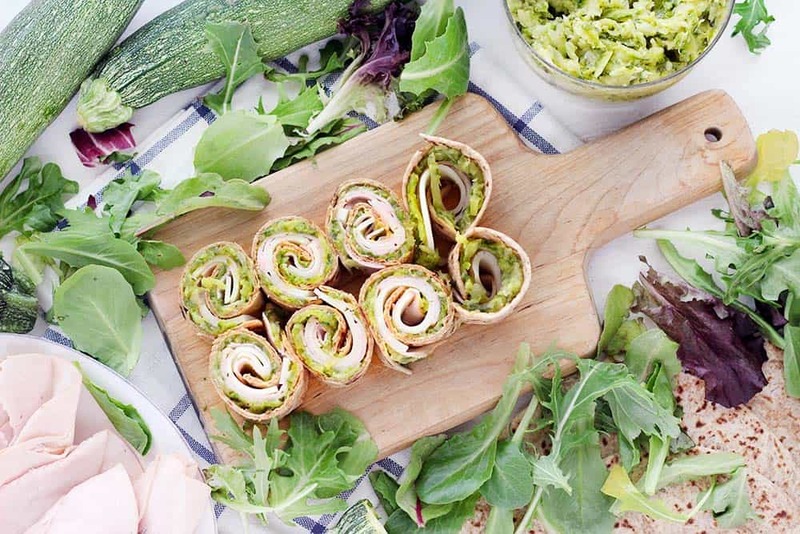 Rolled up in a multigrain tortilla with turkey and mozzarella cheese, these bite-sized sandwich rolls are a lunch you can feel good about sending with your kid to school. The zucchini butter is super easy to make on the weekend and keep in your fridge to use on these roll-ups all week long on busy mornings. And if you have any left over, you can use it in omelets, to stuff chicken breasts, or as a dip with pita chips! To make it, just melt some butter (or olive oil) in a pan, add some shallots (or garlic), and FOUR grated zucchinis (told you it was veggie-packed!). It will seem like a lot, but it will cook down substantially. Cook for about a half an hour until almost all the liquid absorbs and the zucchini is very well cooked- it should melt in your mouth with barely the need to bite. It’s the perfect spread for sandwiches! I used Hillshire Farm Naturals® Slow Roasted Turkey Breast for these roll-up sandwiches, which was easy to find at my local Walmart. I think these roll-ups would be delicious with any other Hillshire Farm deli meat, or as a dip for Tyson Crispy Chicken Strips or Fun Nuggets as an easy, kid-friendly dinner on busy weeknights. Speaking of great deals and kid-friendly fun, I’ll be hosting a giveaway on my Instagram account for a chance to win FREE movie tickets! Make sure you follow @bowlofdelicious to stay up-to-date on the giveaway. And speaking of movies, Teen Titans Go! To the Movies is coming out on July 27th, and it’s sure to be a hit with the kids. You can also check out this Teen Titans Go! 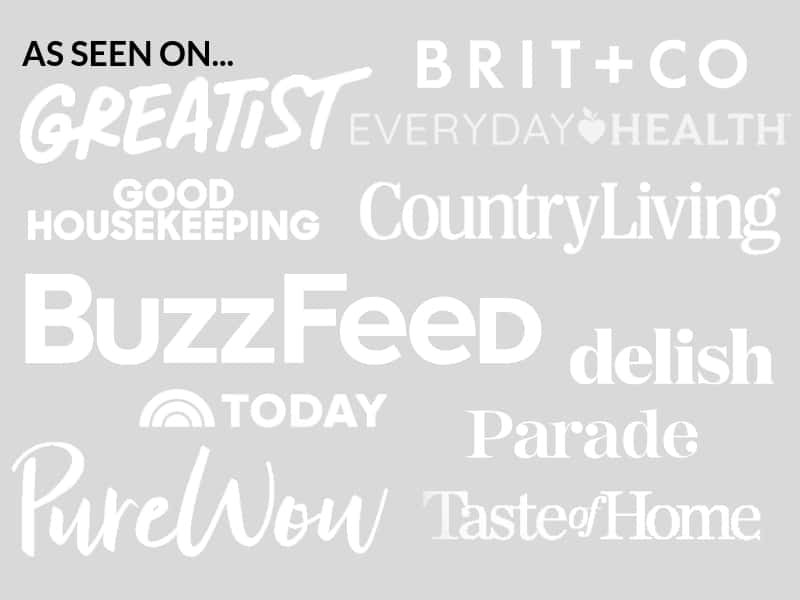 site for fun quizzes and other activities, as well as an offer from Shopkick for Tyson® products that are perfect for back to school. Once you’ve made the zucchini butter, these turkey roll-ups are a breeze to make. 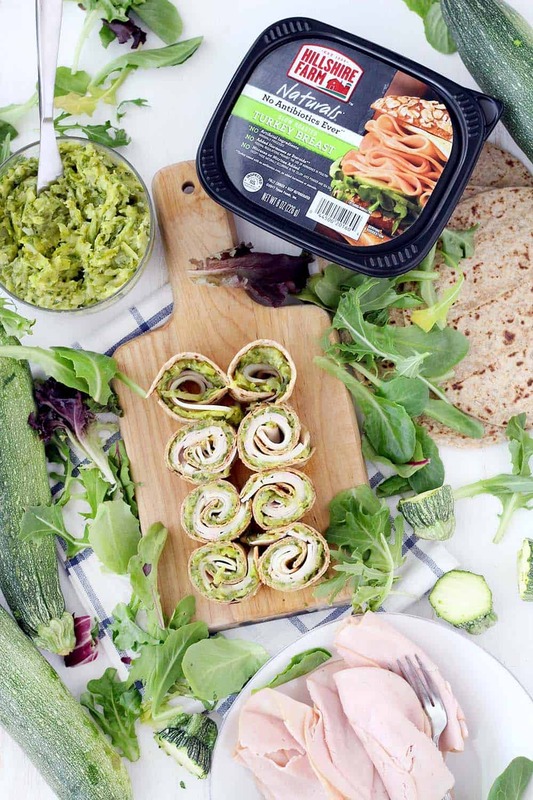 Just spread a multigrain tortilla with some of the zucchini butter, top with the turkey and a slice of mozzarella cheese, and roll up tightly. You can eat it as is, or you can slice it into bite-size pieces. The little pinwheels make them really fun to eat (and also would be great as a snack or appetizer at a party). Whole grain products tend to be a little more crumbly than others. This means the tortilla may crack a little when you are rolling up the sandwich. To make the tortillas more pliable and less likely to crack, I recommend warming them up wrapped in a damp paper towel in the microwave for a few seconds before assembling the turkey roll-ups. Like any sandwich, you can add or omit ingredients as you want. If I were making this for myself, I’d add some roasted red peppers for some extra flavor and pretty color. Some spinach or tomatoes would be great additions, or some spices like cayenne pepper or dill added to the zucchini butter. Feel free to adjust depending on how adventurous your kiddo is with taste! And I know I keep saying that this is great for kids and for back-to-school, but it’s also a great thing for adults to pack for work lunches. I always like my kid-friendly food that I feed my toddler to be adult-friendly, too. 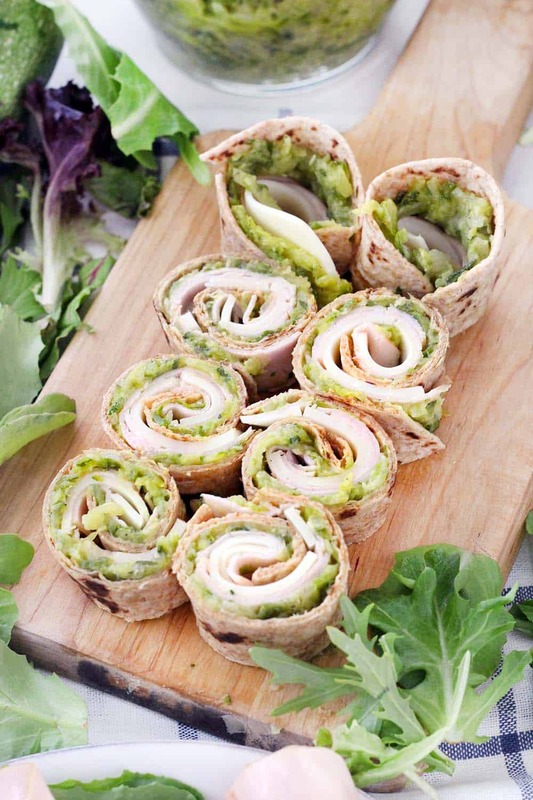 These turkey roll-ups are DELICIOUS whether you are old or young or in-between! I love zucchini for its subtle vegetable taste (and so does my toddler). If you like this, you’ll love this zucchini and corn risotto and this crustless ham and zucchini quiche (both also great for kids). 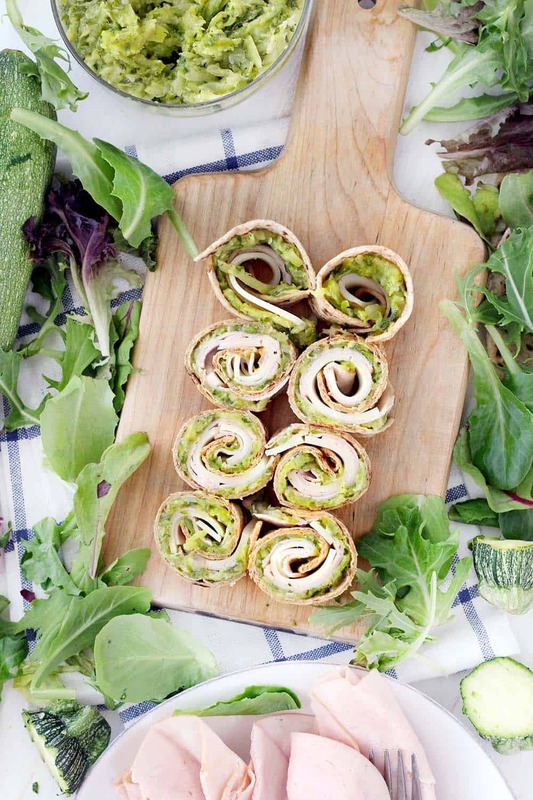 Here’s the printable recipe for Zucchini Butter and Turkey Roll-Ups. Enjoy! 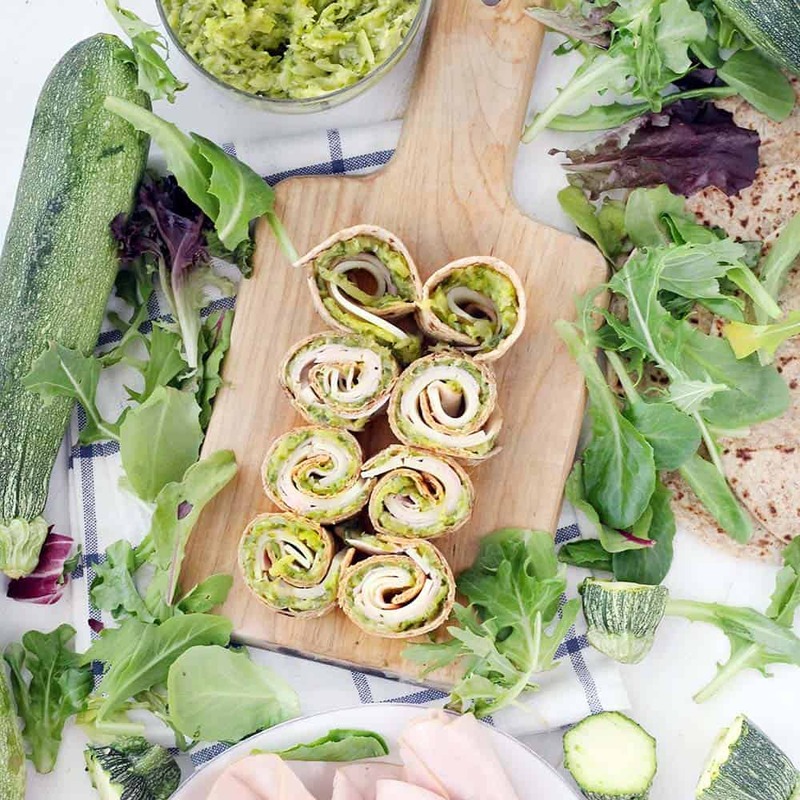 These Turkey Roll-Ups are spread with yummy, veggie-packed Zucchini Butter instead of mayo for an easy meal-prep sandwich for lunches all week long! Great for back-to-school and super kid friendly. Use any leftover zucchini butter in an omelette, as a dip, or to stuff chicken breasts. To make the zucchini butter, melt the butter over medium heat in a large skillet. Add the shallot and stir, cooking for about 30 seconds to one minute, until it begins to soften. Add the zucchini, salt, and pepper, and cook, stirring occasionally, for about 30 minutes, until almost all of the liquid has evaporated and the zucchini is cooked well, with a silky-smooth texture. Taste it- it should melt in your mouth and you should barely need to chew. Remove from heat and allow to cool. To make each roll-up, spread 1/4 cup of the zucchini butter on the multigrain tortilla. Add 2 slices Hillshire Farm Naturals Slow Roasted Turkey Breast and 1 slice of mozzarella cheese. Roll the tortilla up tightly and cut into slices. To make the tortillas more pliable and less likely to break, I recommend wrapping them in a damp paper towel and microwaving for a few seconds to warm them up a bit. I recommend making the zucchini butter ahead of time on the weekend, to make weekday lunch-packing in the morning a breeze! The zucchini butter can be stored in an airtight container for about one week in the fridge. The zucchini butter is also delicious added to scrambled eggs or an omelette for an easy breakfast, served with pita chips as a dip for a quick snack, or stuffed into chicken breasts for an easy "fancy" dinner. Hi, I want to try this but am not sure what sized zucchini you are using. My garden zucchini are all over the board.. Can you translate to cups please? Thanks! Oh and one more thing- smaller zucchini tend to be more tender, and larger are more tough. If you use large zucchini, you may have to sauté it for longer in order to get it to that super soft consistency.